Ann Licater is an award-winning recording artist, world flutist, producer and composer. She created and facilitates “Flute for the Soul” workshops where she plays Native American and world flutes as tools for personal discovery. 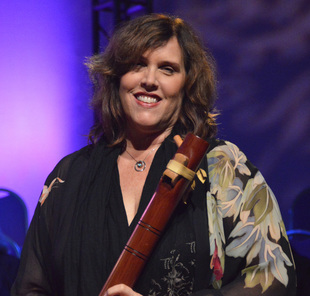 On her five albums, Following the Call, Doorway to a Dream, Invitation from Within, Beyond the Waves and Quiet Spaces: Flute Meditations for Mindfulness and Relaxation as in her healing concerts, Ann’s unique approach merges her intuition, spiritual perspective and traditional music background. Her love of wood and clay flutes led her to study with master flutist R. Carlos Nakai (Navajo-Ute) complementing her years of classical flute training at the MacPhail Center for Music in Minneapolis, MN. Quiet Spaces: Flute Meditations for Mindfulness and Relaxation, Licater’s fifth album released October 19, 2018, has 15 calming tracks featuring soft, deeply reflective solo and duet compositions pristinely recorded in Licater’s signature style for a soothing listening experience. This artful, sonic journey is perfect for mindfulness practices, meditation and well-being. Also recommended for yoga, spa, healing arts, creativity, study, sleep, and overall stress reduction. Licater loves to create music that takes listeners on an inner journey. Licater’s music accolades range from “Top Ten Best New Age Album” by Amazon music editors, to “Best Relaxation Album” by ZMR Music Awards and beyond. Her music is featured on Sirius XM, Soundscapes, a Music Choice cable radio channel, Pandora and Spotify and as in-flight entertainment for Cathay Pacific Airlines, Virgin Airlines and Air Canada under the music category “Well-Being.” Licater has performed at the World Flute Fest at Carnegie Hall, the Awakened World Conference in Rome and Florence, Italy and at “Sound Body, Sound Mind” Specialty Week at Rancho La Puerta in Tecate. Mexico. She holds a B.A. from University of St. Thomas, and an M.L.A. in Creation Spirituality from Naropa University and divides her time between the San Francisco Bay Area and Southern California. Her albums, workshops and performances are booked through her Cul de Sac Mystic Productions. Please visit www.culdesacmystic.com.